After months of rigorous training and development, all five members of this year’s Green ReEntry cohort graduated from the program. On Thursday, November 12, the cohort came together one last time, dressed to impress in brand new suits, to celebrate their accomplishments with friends, family and community leaders. Before learning to green-retrofit homes, the Green ReEntry crew underwent eight weeks of intensive coursework focused on carpentry fundamentals. They also developed critical “soft skills” that deepened their understanding of how to navigate the employment landscape. Longtime leader Nathaniel ‘Hasan’ Smith made Green ReEntry history: he became the first program participant to earn a general contractor’s license, and was hired full-time by the local WJ Management Company. The other four crew members are also pursuing stable employment with WJ Management. Several notable public officials attended the graduation in support of the cohort, including U.S. Rep. Bobby Rush, Cook County Commissioner Jesus ‘Chuy’ Garcia, State Senator Jacqueline Collins, Alderwoman Toni Foulkes. Each highlighted the powerful example of transformation that Green ReEntry program provides to communities both local and nationwide. 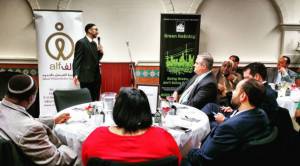 IMAN would like to thank the extraordinary funders whose support has made the Green ReEntry program’s growth possible: AlFaisal Without Borders Foundation, Islamic Relief USA, and the Chicago Department of Planning and Development. 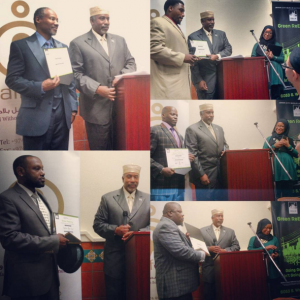 This entry was posted in News, One Chicago, One Chicago One Nation and tagged family, graduation, Green ReEntry by IMAN Staff. Bookmark the permalink.